Help keep the laughs coming! "I like this place! The Joy of Tech comic is good, and the Forums are really something special. You make me laugh, you made me cry, you make me think... how can I help?" People often say that they would like to give something back, and to be very honest, we depend on it! 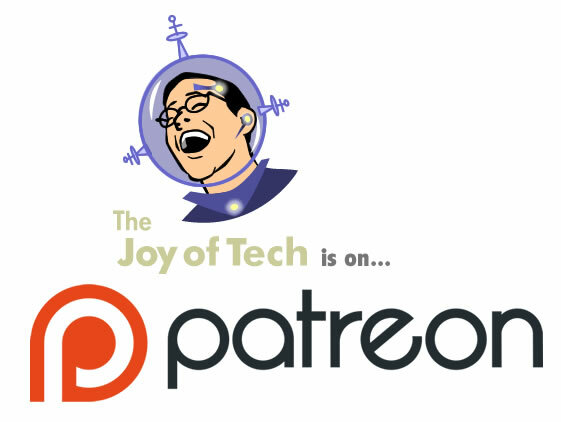 There are several ways you can help keep our work coming... the first being via Patreon! We've been trying Patreon the past year or so in order to support our work, and althought it's not perfect, it's really been pretty good for us. Basically, Patrons help us by donating even a small amount, like a dollar, a month. Please click on over there to find out how you can keep the comics coming! The second way you can nurture our work is our own SuperFan System, which we've be doing for a decade now! If you're looking for our beloved SuperFan system, where you don't have to sign up to Patreon, and wish to donate via it, you can find that here! Donating directly via PayPal: If you're shy about a voluntary subscription, then you can donate a single time here. PayPal is our preferred method for most donations or webstore purchases as we tend to get a larger percentage of the funds, and you now don't need a PayPal account to pay! PayPal takes about 30 cents on any donation less than $15, and an additional 2.2% on anything over that. Click the PayPal logo to support our work. Donate via our webstore set-up: You can donate via our webstore system, using the form below. You can pay via cheque, money order, or credit card, with or without a PayPay account. Make a donation of 10 dollars! If you'd like, you can top up your donation... Ya sure, top it up by 5 bucks! Treat yourself to Tim Hortons, here's another 10 bucks! Dinner's on me, I'm topping it up by 20 bucks! Spoil yourself folks, I'm topping it up by 50 bucks! Hold on to your beanies, here's a hundred more smackaroos! I'm an angel, here's 1000 more bucks... don't spend it all in one Apple Store. And we also now have an Amazon.ca affiliation. Well, any amount at all would be very much appreciated. Perhaps you think our work is worth a buck, perhaps worth a few dollars a month, or maybe more. Think about whether you would care at all if this website wasn't here, or our work was not available for free viewing like it is. Would you miss this place? Your support is very much appreciated and helps us Keep on Geekin'. When someone takes the time, energy, and moolah to give us a tip, we also receive a humongous emotional lift! What will my donation be going towards? It costs real money to keep our site up and running... our hardware, the hosting, the bandwidth and all the other costs of maintaining this site and its two creative human components. It's a lot of work, but chances are good we can keep doing this if we can get some support from the people who visit us each day, either via people buying our merchandise, or via donations. If you enjoy our work and this site, and can spare a few bucks, then please, see if there's anything you would like at the webstore, or perhaps donate what you think we're worth to you. It's just the two of us doing all this, Nitrozac and Snaggy, and we end up working more than full-time to provide the content here. We'd like to continue doing it, ...you can help. Why don't you just support the site via advertising? We do get income from advertising, although that income is not enough to sustain us. We purposely do NOT run offensive pop-up ads, or full page ads, or other awful advertising from our site, and have for over a decade. We don't have native ads or hidden sponsored posts. This was probably not the best business decision we ever made, but we just refuse to be a part of those kind of annoyances. We're are always looking for more legitimate sponsors, and we don't think advertising has to be evil. If used properly, it can work great for all parties. How much have you made through these donations? Henrik sends in 2 bucks! Thanks Henrik! Johan sends us 10 bucks! Thanks Joha, you rock! Cantares sends us 8 bucks! Thanks Cantares, we really appreciate that! The wonderful and generous Eric sends us 100 bucks! Thank you so much Eric!!! The awesome Anonymous sends us 110 bucks, again! We appreciate that, wow! This really really means a lot to us and made a dark year a litte bit brighter, thank you! Jesse sends us 25 cents, and then 10 bucks later in the week! Message: I’m on fumes until Friday and I will tip you more generously, you really made my 15 years on earth so much better, we all need your humor and love the strip! Thanks Jesse, that message was worth a million bucks to us! Johannes sends us five bucks! Thanks Johannes! L. Ravi sends us 25! Thank you! We received a very generous donation from Richard and Muriel! Thanks so much! Michael sends us five! Thanks Michael! Peter sends us 20 bucks! Message: The "Lock her up" cartoon was genius. Thanks Peter! We like how you're thinking too! William	sends us 25 bucks!!! Thank you so much, we really appreciate that! Roberto	sends us 10 bucks! l! That is so kind of you, thank you so much!! Norm sends us 10 bucks! Thanks Norm! Joel sends us 10 bucks! Thanks Joel! Melinda sends us 25 bucks! Thank you so much Melinda! Manuel sends us a fiver! Thanks Manuel! Harald sends us 15 dollars! Thanks Harald! James sends us 10 bucks! Thanks James! Kenji sends in 20 bucks! Thank you so much Kenji! Holly sends us 10 bucks! Thank you Holly! Martin sends us 11 bucks! Thanks Martin! Adrian sends us 15 bucks! Message: This, sir, is a classic. It raised the hairs on the back of my neck. BRILLIANT. Worthy of another donation, me thinks. Thank you Adrian! Arthur sends us 20 bucks! Thanks Arthur! Kevin sends us 5 bucks! Thanks Kevin! Adrian sends us 10 bucks! Thanks Adrian! The wonderful David B. sends us 10 bucks! Thanks David! The marvelous Hanna sends us a fantastic 49 buckaroos! Thanks Hanna, you rock! Björn sends us 15 bucks! Thanks Björn! Asger sends us 10 bucks! Thank you! Anonymous sends us 550 BUCKS! Holy moley that is soooooo generous and we thank you so much Anonymous!!!! Klaus sends us 48 US cash in the mail! That was awesome and so fun to receive, thank you so much Klaus! Alan sends in 10 bucks! Thanks Allan! Julian sends us 30 bucks! Wow, thank you Julian! Victor sends us 50 bucks, wow, thanks Victor! Chris sends us 10 bucks, and buys an awesome Hacker Hat too! Thanks Chris! Donna send in 50 big ones! Wow! Thanks Doona, you are awesome! Conrad sends us 25! Thanks Conrad! Redhead's Hub sends in 12 bucks! Thanks! Daniel sends in 15 bucks! Thanks Daniel! Donald sends us 50 bucks! Thanks so much Donald, that is awesome of you! Steve sends us 30 bucks! Wow thanks Steve! David sends us 25 bucks! Thanks David! Andreas sends us 15 bucks! Thank you! Juergen sends fifty dollars! Thank you so much Juergen! Steven sends in 25 bucks! Thank you Steven! Jared send us 50 big ones! Wow, thanks Jared, you rock! Michael sends 25 too! Thanks Michael! Susan sends us 25! That is so sweet, thanks so much Susan! Mike sends us 25! Thank you Mike! Franz sends us 15 bucks! Thanks Franz! John sends us 25 dollars! Thank John! Bin Abdul Rahim Azlan sends us 5 bucks! Thanks! Whoa! Steve sends us the super generous amount of 100 bucks! We super appreciate that, thanks Steve! David sends us 30 bucks! Message: Keep rocking! The world needs your talent, humor and insights (even more now).... Thanks for all the laughs! Thank you David! Kurt sends us 10 bucks! Thanks Kurt! Mike sends us 25! Thanks Mike! Thomas sends in 10! Thanks Thomas! Nicolai sends us 5 bucks, thanks! James sends in 25! Thank you James! Anthony sends us 30 bucks! Thank Anthony, that's awesome! Jeff sends us 20 bucks! Thanks Jeff! Richard sends us a 25 buck cheque in the mail! Much appreciated old-school technology! Thanks Richard! Shane sends us 100 buckaroos! WHOA! Thank you so much Shane! Damien sends 10 bucks! Thank you! Charles sends us 25! Thank Charles! Gernot sends us 10! Thanks Gernot! Marc sends us THIRTY BIG ONES! Thanks Marc! Trimillennium Corporation sends us 2 bucks! Thank you Trimillennium Corporation! Tony sends us ten! Thanks Tony! Elliott sends us 25 big ones! Thanks Elliott! Patrick sends us 15 bucks! Thansk Patrick! Albert sends us 10 bucks! Thanks Albert! Karen sends us 15 bucks! Thanks Karen! Michael sends us 110 bucks! WHOA, thank you Michael, that is so generous of you! Bart sends us 15 bucks! Thanks Bart! Robert sends us 100 bucks! WHOA, thank you so much! Brian sends us 20 bucks! Thanks Brian!!!! The Buddy System, LLC sends us 20 big ones! Thanks!!! James sends us 10! Thank James, much appreciated! Julian sends us 20 big ones! Thank you so much! Bertrand sends us five! Thank you! Ged sends 10! Thanks Ged! Andreas sends us 10 bucks! Thanks Andreas! Franks sends us 25 big bucks! Thansk Frank!!! Joel sends 5 bucks! Thank again Joel! Greg sends us 15 bucks, which was awesome and much needed! Thanks! Robert sends us 20 big ones! Thanks Robert! The mighty Anonymous sends us 110 bucks, again! Thank you so much, we really needed that!!!! David sends us 100 BIG BUCKS! Thanks so much David, that means a lot more than just 100 bucks to us! We SUPER appreciate that. Otto sends us 15 big ones! Thanks Otto! Brooks sends us 10 bucks! Thanks Brooks! Colin sends us 40 buckaroos! Thank you Colin, you rock! Andreas sends us a fantastic fifty bucks! Thank you so much Andreas! Lawrence sends us 60 bucks! Wow thank you so much Lawrence! Terran sends in ten! Message: Been enjoying your comics! Sorry to hear the finances are not working out as well as you had hoped. Best wishes for a successful outcome! Thanks Terran! Carsten sends us 20! Wow, thanks Carsten! Roberts sends us 50 buckaroos! Wow, thank you so much Robert! Karole sends us an amazing 50 bucks! Thank you Karole, you are so kindl! George sends us 25 big bucks! Thanks George! Michael sends 10 bucks! Thanks Michael! Elizabeth sends in 5 bucks! Thanks Elizabeth! John sends 10 bucks! Thank you! John! Chandra-Mohan sends us 20 mighty bucks! Thank you!! Guy sends us 10 bucks! Thank you Guy! John sends us 15 bucks! Thanks John! Andrea sends us ten bucks! Thank Andrea! Lee sends 20 bucks! Thanks Lee!! Christian sends us 10 bucks! Thanks Christian! Alan sends us 20 bucks! Thank you so much Alan! WHOA! Bart sends us 100 bucks! Thanks so much Bart! Louis sends 10 bucks! Thanks Loius! Seth sends 20! Thanks Seth, you rock! Wow! Steve sends us 60 bug bucks! Note: "I enjoy reading your comic, now it's my turn to contribute" Thank you so much Steve! Frank sends us 15 ! Thanks Frank! Gerald is a superstar and sends us 50 bucks! Thank you so much Gerald! Ross sends us five big ones, thanks Ross! Tim sends ten! Thanks Tim! Allen sends us 10 bucks! Thanks Allen! Patrick sends us 50 big ones! Thank you so much Patrick! Thomas sends us 10! Thanks Thomas! Joel sends us 20! Wow, thanks so much Joel! Frank send us a five! Thanks Frank! Hylen sends 5 bucks! Thanks!!! Richard sends in 10 bucks! Thanks Richard! Julian sends us 10 bucks! Thanks Julian ! WOW! Maureen sends us 220 buckaroos! Message: $200 as a donation because I’ve been reading your site for so long and an extra $20 to cover whatever PayPal slices off the top.Thank you so much Maureen, you are AMAZING! Wilson sends us 5.30! Thanks Wilson! Colin send us 30 bucks! Thanks Colin, that is super amazing of you! Christopher sends us 20 big ones! Thanks Christopher! George sends us 25 bucks! Thansks George, you rock! Greg sends us 10 dollars! Thanks Greg! Brian sends 20 bucks! Thanks Brian, you're awesome ! James sends us 10 buck-a-roos! Thanks James! Seth sends us 10 bucks! Thanks Seth, you rock! Sabastian sends us 15 bucks! Thanks so much Sabastian! Daniel sends us 15! Thanks so much! Fabien send us 30 bucks! Thanks Fabien, that is awesome of you! Charles send in 20 bucks! Thanks Charles! John sends 10 bucks! Thanks John! Ged send us 15 smackaroos! Thanks Ged, you rock! Bernard sends us 5 bucks! Note: Thanks for comic 2374. Point fingers at [whomever's side you hate] but at least let's be clear about definitions. I am doing Patreon but I have sent another $5 through PayPal because dammit, we need clarity. Thanks Bernard! Tim sends us ten, and that terrifiic! Thanks Tim! Oakbog sends us 50 bucks! Thank you so much Oakblog! You rock! Anonymous sends us 100 bucks, again! That you so much, we so, so appreciate that! Wow, we are so appreciative of that, thank you so much!!!! Christophe sends 10 bucks! Yay! Thanks Christophe! Michael sends us 20 big ones! Thanks Michael, Super appreciat that! Maxwell sends 10 bucks! And bought a book, and made it his Super Lucky Book! Thanks Maxwell! Stephen sends us 5 bucks! Thanks Stephen, that's really nice of you! Quentin sends us 50 bucks!! Wow that is amazing of you Qunetin, you rock! Holy Moly! Wow! Muse Clothing Company sends us 500 BIG ONES! Thank you so much MCC, that is mind boggling and we appreciate that so much! Frank sends up 20 bucks! Thanks Frank, you rock!! OMG! Bart sends us 100 bucks! Thanks Bart, that is so fantastic of you! Wow! Mark sends us 100 smack-a-roos! Thank you so much Mark, that is super amazing of you! Arthur sends us a wonderful 25 bucks, thank you so much Arthur! Joel sends 20 bucks, and this wonderful message... Thanks, as ever, for your insightful and entertaining strip. Thank you Joel, you made our day! Peter sends 10 bucks! Thanks Peter, that's really nice of you! Dominic sends 60 giant bucks our way! Thank you so much Dominic, you totally rock! Thanks Duane, that is super appreciated, and makes us go loonie!!! Chris sends 5 bucks! Thanks Chris, you rock! Michael sends us 10 big ones! Thanks Michael!! Thomas sends us 5 big ones! Thanks Thomas! September and October and November and December! Damien sends us 15 buckaroos! Thanks Damien, we really appreciate that! The mighty anonymous donor sends us 110 dollars, as he has for many years. Wow, thank you, that really means a lot to us. Thank you again! The awesome Chris sends us $10.98! Message: Keep up the good work! I usually look in a few times a week but not without fail. Cheers! Robert sends us 25 big ones! Thanks Robert, we really REALLY appreciate that! Sebastian sends us 10 bucks! Thanks Sebastian, you rock! Christian sends us 10 big ones! Thank you! ouch, that is bleak. Thank the tech godz for our Superfans! Bob sends in 10 bucks! Thanks Bob! George sends us 25 big ones! Thanks so much, we really appreciate that! Shooshie sends in 35 big ones and a really nice note! You rock Shooshie! ! Joseph sends 30 big ones! Thanks Joesph, that was awesome of you! Gernot sends us 10 bucks! Thanks Gernot, you rock! Raphael send us 20 bucks! Message: Thanks for the Joy-of-Tech comics! Keep up the good work and have a happy new year 2015! Thanks Raphael! 2015 just got happier! RScottV sends us a big 50! Message: I appreciate you for taking on one of the most dangerous jobs in the world. Have a good weekend! You just made our weekend RScottV, thank you so much! September/October/ and November and December! And again, a mighty WHOA! That awesomely generous and wishes-to-remain-anonymous super, super awesome person sends in $110. Thank you so much, that is really appreciated and it really makes a difference, both financially and for our morale! Shoohsie sends a mighty $25! Thanks again Shooshie, you rock! Joel sends us 10 big ones! Message: Thanks for 2068; vintage JoT! Thanks Joel!! It's YOU that are of fine vintage! Chris sends us $4.99 with the message... Keep on doin' what you're doin' ! Quentin sends in 20 bucks! Thanks Quentin, we super appreciate that! Shooshie sends us 50 big ones! Wow, thank you so much! Raphael sends us 20 big ones! Thanks Raphael, you rock! Thank the comic gods for our Superfans who helped us out via subscriptions! The awesome, fantastic, and mighty Tristan send us one hundred big ones! THANKS TRISTAN!!!!!!! Sinan sends us 10 bucks to start off 2014! Thanks Sinan, we really appreciate that! WHOA! That awesomely generous and anonymous super Christmas angel sends in $110 AGAIN. Thank you so much! Thanks again to our Superfans who helped us out via subscriptions during this time period, without you folks we'd be toast. Tristan sends 50 big ones! Thanks so much AGAIN Tristan! Spiderman sends in 60 bucks, and Solid SuperFans himself! Message: It's been a good year for me, and you guys have meant so much to me over the years, this is the least I can do. -Spidey Wow, thanks so much Spidey! Maxwell sends us a mind-blowing $125!!! Message: I've been reading you all for at least a decade now, so here's a little something for the Joy of Tech and (especially) all of After Y2K. You and Nitrozac have long since earned it! Whoa, thank you soooo much Max! Paul sends us five big ones! Thanks Paul! Terry starts our year off on a pleasant note... five of them! Thanks Terry! Brian sends us 50 big ones! Thanks so much Brian! That is amazing! Anonymous sends in 110 smackaroos AGAIN! Thanks Anonymous, you continue to blow us away! Colin sends us 25 big ones! Message: Merry early Christmas. Early Christmas rocks, thanks Colin! Mikael sends us 8 big ones and this message: Love your comic, Keep up the great work :) Thanks Mikael! Shooshie sends in 25 bucks! You rock Shooshie! Shooshie sends in 20 bucks! You rock Shooshie! Henrik sends us 20 bucks! Thanks so much! ck sends us 20 big ones! Thanks so much! Just when we had given up hope, Engin sends us $15! Thanks Engin! Yikes! Thank the comic gods for our Superfans, who, to be quiet honest, have kept us going all these years with their incredible generosity. RScott sends in 50 big ones! You rock, thanks so much! Wow! Natalie sends in 60 bucks! "...to help enable you to make great cartoons and great web entertainment." Thanks Natalie, you are wonderful! Adam sends us 5 big ones! Thanks Adam! Robin sends in ten! Thanks Robin, you rock! George sends in 10 bucks! Thanks George! Anonymous sends in 110 smackaroos. Thanks again Anonymous, you rock our world! Tristan sends 50 big ones! Thanks again Tristan, you are amazing!! David sends in 20 bucks! Thanks again David, you rock! Evgeny sends 5 bucks! Awesome, thank you! James sends us 25 bucks! Awesome, thank you James! William sends us 25 bucks! Thanks William, you rock! Terry sends us 10 bucks! Thanks Terry! Shooshie sends $25! (I think the TTBs convinced him to invest!) Awesome, thanks so much Shooshie! Marius sends us 10 buckaroos! Thanks Marius! John sends in 20 bucks! Thanks John, much appreciated! James send us 20 big ones! Message: Your 4/1/11 (or is it 1/4/11?) JoT is the best evah, thanks. I'm still laughing as I type this! Keep up the great work. Thanks James! Bleak winter months indeed! Ouch. Bart sends us 100 bucks! Message: Thanks for bringing me Joy in the Morning. Happy New Year. Whoa, holy cow, and WOW! Thanks Bart! Shooshie sends us 20, wow, thank you and thanks for the kind words! Ugh, Mighty Club sends us 20 bucks! Thanks Ugh!!! September and October and November and December. Adam sends us 5 bucks! Thanks Adam! Paul sends ten big ones! Thanks Paul! Lee tips us ten! Thanks Lee, we really appreciate that! David sends 10 bucks! Message: So nice to see Clarence; I thought I'd have to wait till Christmas..! Love & Best Wishes, David B. Thanks David, it's like Christmas in August for us! Mariano sends us 12 bucks! Thanks Mariano, much appreciated!! Adam sends us 5 bucks! Message: Hahahahh.. the axe. Props for the double entendre. Thanks Adam! Azmir sends us a buck! Thanks Azmir! Dennis sends us 10 big ones! Much appreciated, thanks Dennis! Anonymous sends us another hundred and ten bucks! Wow, thanks again Anonymous! Jesse sends us another buck! Thanks Jesse! Ugurcan sends us $31.39! Message: Today is my cartoonist appreciation day. :P Thanks Ugurcan! By strange co-incidence, today is also Cartoonists-who Really Appreciate Cartoonist Appreciation Day! You rock! Greg from SmileonmyMac sends 20 bucks! That makes us smile! Thanks Greg! Emko sends us a fantastic fifty! Message:A Merry Christmas and a Great New Year. Sorry it couldn't be more; a bad year. Emko, you rock, we so much appreciate that. Happy New Year to you, and all the best in 2010! Jesse sends us $4.14, and this priceless note... You guys make my day nearly 3-4 times a month. Thank you for always being the laugh I need! Have a good one! Enjoy the $4.14. Thanks Jesse!! Jesse sends a buck! Thanks Jesse! David sends 3 bucks! Thanks David! James sends us 10 bucks! Awesome, thanks James! Shooshie sends us 20 bucks! Thanks Shooshie, you rock! Once again, Anonymous donates 100 bucks... wow and a wooot!! Message: 1) I enjoy joy of tech and (most of) the forum while lurking but, although Snaggy reassured me Simon is safely with you all, I wonder about him vs. the prairie dogs. 2) Donation is, as always, anonymous. Thanks A., you made our month, and we really appreciate your continued support. Pierre donates 50 bucks... wooot!! Thanks Pierre, you just made our week! Much appreciated! Ugurcan donates $17.12! Message: That's what's left in my paypal after spending it all on useless junk :) At least some of it is in good use now... Thanks Ugurcan, much appreciated! Shooshie sends us 25 big ones, and a very kind note, including this nugget... "I read Joy of Tech every day, or at least every day that it changes, and you guys pretty much nail it all down... often before I even know what's happening. That puts me in the awkward position of getting some of my most relevant news and opinions from... a comic strip. LOL!!!" Thanks Shooshie, for the kind legal notes and the kind note! Those made our day! Robert sends us 10 bucks! Thanks Robert! David B sends us 10 big ones! Message: You've got me again, with those retro buzzers, whoopee cushions and black face soap! Definitely worth $10..! Thank you again David! Scott sends us six bucks! Message: I've never donated to a cartoon before, but your Prop 8 panel convinced me! Thank you for your work and support!!! Thank you Scott! Emko sends us 50 bucks! Thanks Emko, that was so awesome of you! Doug sends us 15 bucks! Thanks Doug! Anonymous sends us a hundred and ten bucks! Whoa. Message: Simon is still in bad shape and I am still anonymous, some things never change. At least the US dollar is worth a bit more than last year. Wow, thanks again Anonymous! James O. sends 25 big bucks! Thanks James, that is awesome of you! Kevin sends us 5 bucks! Message: Thanks for the comic! Thank you Kevin! James H. blows us away by sending us $100! Thanks James! Jessie sends a buck! Thanks Jessie! CSC sends us 10 bucks and a very nice letter including ... I am a Mac user, I even got .Mac subscribed, and I check your comic every day. I also got your dashboard widget. I am a big fan of yours... I wish you good luck all your life, and thanks for bringing us a smile about tech every day. Keep up the good work. Best Regards, Thanks CSC, we really appreciate that! Timo sends us 30 bucks! Wow, thanks Timo, that is really awesome of you! Simon tips us again, and it's the very neat sum of $13.37! Message: Have some more money. WooT! Thanks again Simon! Gerald sends us $15 big ones! Message: Keep the good things on ! Greetings from Marseille, France! Thanks Gerald! Peter sends us 5 bucks! Message: Dudes, I ran the "cracked iPhone" gag on my boss' Mac Plus almost 25 years ago -- a classic! Thanks! Ha ha! Thanks Peter! Simon again sends us the very Internet-y $4.04! Thanks again Simon! Simon sends us $5.30! Thanks Simon! See all the older donations here!